Nach der Sinfonia concertante KV 364. Composed by Wolfgang Amadeus Mozart (1756-1791). Edited by Christopher Hogwood. Arranged by Anonymous. This edition: urtext edition. Paperback. Barenreiter Urtext. After the Sinfonia concertante K. 364. Score. Composed 1808. KV 364. Baerenreiter Verlag #BA09504. Published by Baerenreiter Verlag (BA.BA09504). ISBN 9790006533572. 30 x 23 cm inches. 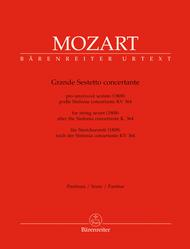 Mozart's Sinfonia concertante for violin and viola, K. 364 (320d), is his only complete surviving work in this genre. He wrote it in 1779 after returning from Paris and Mannheim . For two decades it was known only in a few copyists' manuscripts. The first edition did not appear until 1802. The work achieved great popularity that same year, particularly the arrangements for piano four-hands and piano trio. This arrangement for string sextet, dating from 1808, is interesting not only for its unusual scoring but also for the way the two concertante instruments interact with the other strings. Our edition revives this arrangement after almost two centuries, drawing primarily on the sole surviving source: the first edition in parts, published by the Vienna Stamperia Chimica in 1808. The editor, Christopher Hogwood , recounts the history of the work and the particulars of the arrangement in a trilingual preface (Eng ./ Ger./ Cz .) and a critical report. 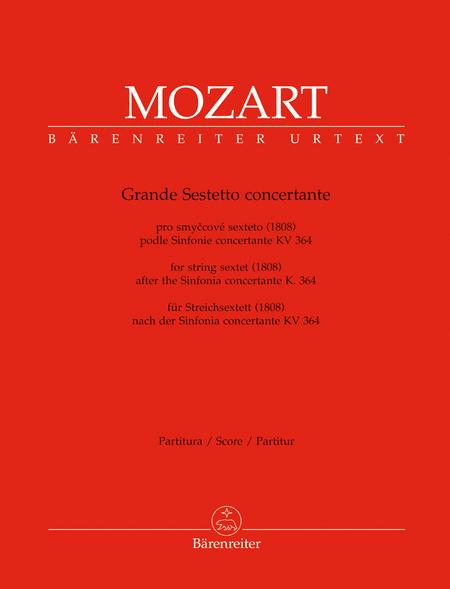 Our new edition takes into account both the original print and the text from theNew Mozart Edition.